I’ve admired my friend Beth’s handmade ritual cords for quite some time. I love fiber arts and I’ve had the pleasure to watch her skill and artistry develop for many years. I knew I wanted a custom ritual cord dedicated to Loki and I knew I wanted to take it to PantheaCon with me. I was nervous about being away from home for some long; I’m a bit reclusive and have to manage a spectrum of chronic illness symptoms and I prefer to be home when I don’t feel well. I thought that having something emotionally and spiritually meaningful with me during my trip would help and Beth was happy to work with me. I chose to get a custom cord instead of a premade one. The customization process includes a design consultation regarding colors and detail elements, including charms and stone beads. The cord arrived in time for me to leave and I was overjoyed to take it with me. My cord there in the picture has been carried on airplanes, through hotels, handled by convention goers, and draped on the altar. It’s had soap, soup, water, and other stuff splashed on it. One end got singed on a candle. 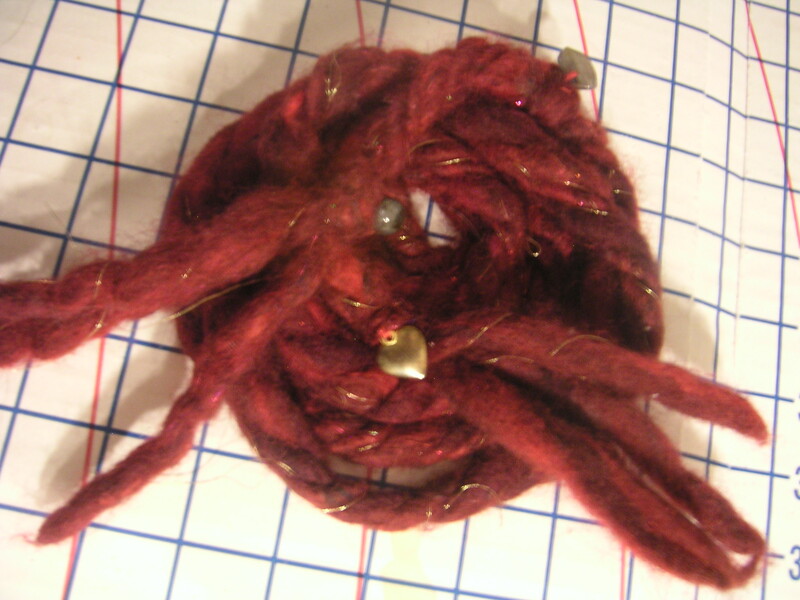 You can see how some of the ends are felting. Yours will naturally arrive in pristine condition but I can promise that yours, like mine, will become even more precious and beautiful with use. This cord is very special to me. It magnifies My Lord’s presence here and when I wear it I feel like I’m being hugged on the inside. I’m so touched to have something that Beth worked hard on and her care and consideration shows at every level. If you’d like to see Beth’s many current offerings, visit her Etsy shop; you can skip directly to her current ritual cord listings here. If you’d like to learn more about her custom ritual cords, this is the link you want. I absolutely live for reviews such like this one! This isn’t as easy path, being married to or closely involved with gods and spirits; unlike with mortal relationships (where you can physically touch the other person), it can be hard to find something tangible to hold onto that instantly connects you with your Beloved, I can’t even express how happy it makes me to be able to *make* something that can serve as that tangible connection for other people. My shop has branched out beyond fiber, but it started with fiber–and this is why. What makes this even more special to me is that Silence–a long-time friend–was the first person who showed me, in person, what spinning on a spindle looked like. This was many years ago, when Jo and I still lived back in Philly, when Silence came for a visit. Seeing him spin in person helped to spark an obsession with the fiber arts that hasn’t died out since (despite my having extended my interests to other crafts as well). And so, Silence? You helped do this. I would very likely not be making ritual cords today if not for you. I’ll repeat what I told you at con. Loki and I have a history of not mixing well and it was quite a pleasant surprise to experience His energy in such a calming way through the cord.